The decision to completely shave your head is one that doesn’t come lightly at all. It takes a lot of courage and will-power to bring a razor to your head to get rid of each and every strand of hair that rests upon it, but for a lot of guys out there, shaving their head is the best decision they’ve ever made. If and when you do ever decide that this is a move you want to take as well, it’s important to always use the best aftershave for a bald head. Just like when you apply aftershave to your face after trimming up your mustache or beard, your scalp requires similar care and attention. A shaved head may require less maintenance than a full head of hair, but that doesn’t mean you’re completely out of the woods just yet. A bald head might be easier to take care of, but you still need to apply moisturizer and after shave to it to ensure that your head stays as healthy and hydrated as it can. We’ve done the hard work for you and picked out 5 of the best moisturizers and after shaves around, and without further ado, here are our picks. If you’re a guy that’s wondering what to put on your bald head, one of the first things we wholeheartedly recommend is Bump﻿ ﻿Patrol’s After Shave Bump Treatment. This particular product has been approved by dermatologists and is recommended by barbers everywhere, and the results that this thing kicks out makes these two points of praise quite evident. Applying Bump Patrol’s after shave couldn't be any easier. Once you’ve shaved your head in the normal routine that you do, simply apply this stuff everywhere on which you took your blade or shaver to. Rub it into your scalp, and you’re done! As the name suggests, Bump Patrol helps to heal any razor bumps or cuts that you come across and also kicks out healthy properties to reduce and prevent any future bumps from happening as well. Some guys think that a product like this is too good to be true, but we can say without a doubt that it really does work as well as it's advertised. Another great product in the bald head skin care market is Bee Bald Heal Post-Shave Healing Balm. This is another cream that gets applied to your head as soon as you’re done shaving, and similar to Bump Patrol, it helps to calm down any irritated skin and soothe it so that it feels refreshed and hydrated. In addition to making you feel good, Bee Bald also helps to improve the physical appearance of these bumps and cuts as well. A shaved head with scattered razor bumps isn’t the most pleasant thing to look at, and Bee Bald does a great job at minimizing the amount of bumps that you have to endure while cleaning up your head of any pesky hair. Bee Bald is made out of only the best and most effective natural ingredients and botanicals, and this awesome makeup allows the balm to keep your skin’s composure and structure at a very healthy level. Guys everywhere are quickly flocking to Bee Bald as their go-to aftershave solution when it comes to shaving their head, and we absolutely suggest you try this stuff out for yourself as well if you haven’t already. Looking for something that’s been around for a while long and is said by tons of men to be the best moisturizer for a bald head ever? If that’s the case, it’s hard to find something more effective and enjoyable to use than High Time’s Moisturizer — more specifically, the Dare To Be Bald Scalp Treatment. A price tag of a little less than $8 will get you a 4.75-ounce tube of this moisturizer, and that gets you quite a bit more bang for buck when compared to the Bee Bald balm that we just looked at above. High Time does a phenomenal job at healing and soothing your head right after you get done shaving it, and one of the reasons it’s so fantastic at this is thanks to the tea tree oil that’s very prevalent in the moisturizer’s ingredient list. Along with keeping your scalp feeling hydrated and clean, High Time’s product also gives it a nice shine so you can look and feel your best at the same time with one single product. Click here to read more about High Time Moisturizer Bald Scalp Treatment on Amazon. Going back to the Bee Bald brand, another product from the company that’s worth checking out is the Smooth Plus Daily Moisturizer. This is a cream that can be applied to both your head and entire face, and it’s essentially just another layer of protection for your skin to keep it in as good of shape as you possibly can. Bee ﻿Bald’s Smooth Plus Daily Moisturizer is super easy to apply, and this single cream moisturizes, hydrates, and tones your face and head all at the same time. This allows your face and shaved head to feel refreshed and cool throughout even the most grueling day at the office, and once you start using this stuff, it’ll be pretty much impossible to go through a single day without applying it first thing in the morning. Some guys have commented that they don’t like the somewhat sweet smell it gives off, and while we personally don’t have an issue with it, this is something that’s entirely subjective. Last but most definitely not least, the fifth and final best aftershave for a bald head that we strongly recommend is the HeadBlade HeadLube Glossy Moisture Lotion. You get a 5-ounce bottle for just a tad more than $10, and similar to the other products we’ve already talked about, HeadLube helps to moisturize your head and keep it feeling as strong and healthy as possible right after a good shave. The glossy nature of the aftershave provides your scalp with a very shiny appearance, and if that’s a look you’re going for, this product does it better than any of the other ones on this list. Shea butter and tea tree oil are two of the most important ingredients for HeadLube, and you also won’t find any perfume or dye anywhere in its makeup. It may not be the most exciting product we’ve talked about today, but if you just want results and nothing more, this is a product that you really do need to try out at least once. Click here to view HeadBlade HeadLube Moisture Lotion on Amazon. 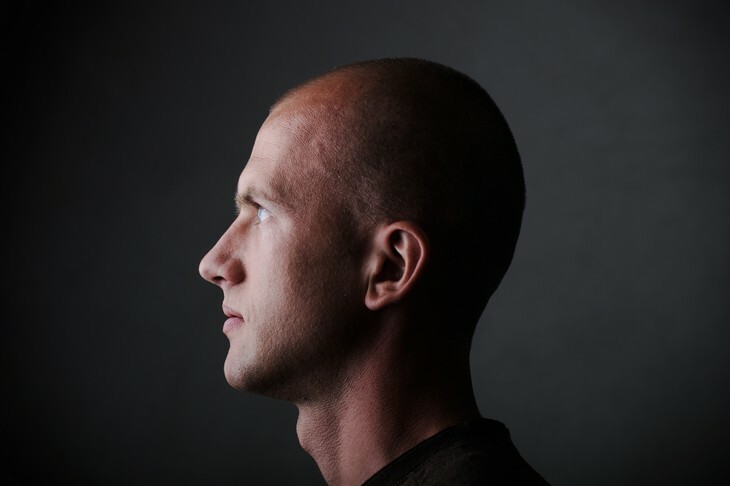 The shaved head isn’t for every guy out there, but if you’re reading this article, there’s a good chance you either have one or have been thinking about finally making that plunge. We’ll leave that decision entirely up to you, but if you do ever decide to go all in and get rid of every last bit of your hair, these are 5 products that will really validate your decision to go all natural.